Healthy Food Program brings skills and grows food intake at Crossroads. Say CHEESE! Or, say TEETH! This update is from Ms. Kate in Room 14. 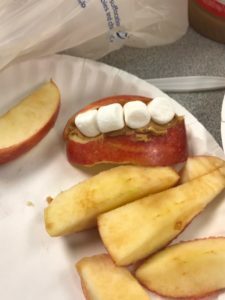 She made apple & peanut butter mouths with her class as they are learning about Dental Health! Sweet potatoes are delish, but many of our parents have said that their child has refused to try them in the past. Here’s but one student who found them to be pretty darn tasty! Thanks Room 11 for the picture! 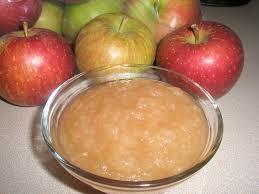 Yummy applesauce! 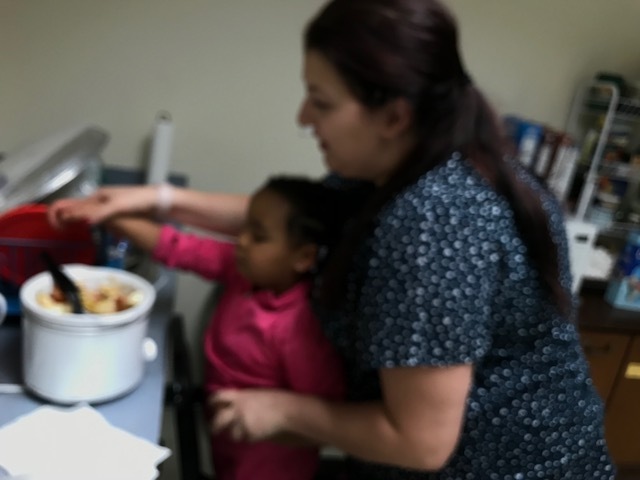 A recent Healthy Food Program activity in Room 13 involved practice with cutting, measuring, and putting the ingredients together into the miniature crock-pot. Then stirring, and waiting for the time to taste it! All it takes is a few apples, a little bit of cinnamon, sugar or honey and water to make this delicious and healthy snack or side. Supervision for safety was very important; that said, this is a great activity to try at home! Please let your child’s teacher know if you do, and how your child enjoyed the prep and the food! We are ever grateful for the support we receive from grants that are sustaining our Healthy Food Program (HFP). This year, funding from The Schenectady Foundation and The Allen Foundation is making the program possible. 5/2017 Our Healthy Snack Cart is a huge hit with the kids each Thursday! Here, a young man from Room 12 is cutting up oranges to put on the cart. He sets it up each week for the classroom in charge of pushing it around each week. Every week he has grown more and more independent in the tasks, like getting the fruit and vegetables, finding a board or plate to cut on, getting a bag open to put the foods in, and putting the sign on the cart to tell everyone what’s being offered that day. He is also getting great at going to the classroom of the week and telling the teacher that the cart is all set up and ready for her class to push. That is a lot of skills! A lot of progress! 3/2017 The Healthy Food Program, so important for our children, is funded solely through grants from foundations. So far, we’ve gotten wonderful support from The Schenectady Foundation, in Schenectady County, and The Hawley Foundation, in Saratoga County. This program is designed to help our students – most of whom experience aversions and difficulties with foods – become more tolerant of new and different foods. Our teachers do a miraculous job of weaving cute food activities into their lesson plans, incorporating themes, and the very foods their students find most challenging. Here, Room 1 is eating all green foods! They have peppers, grapes, pickles broccoli, and just a little taste is a big goal for some! Want to volunteer to help with our Healthy Food Program? Be a Classroom Helper! Please contact Vickir@Crossroadcenter.org for information about volunteering. Our Healthy Food and Nutrition Development Program has a new way of reaching our students! About a month ago we started a weekly Healthy Snack Cart, and it’s been going really well! On Wednesdays, what we’ve ordered from Capital Roots Veggie Mobile comes in. Some of our students sorting out the fresh veggies and fruits, and delivering to each teacher’s classroom what she’s ordered for that week’s Healthy Food Program. This young man takes great pride in doing this job, and then on Thursdays, also washing the items and setting up the Healthy Snack Cart. The Snack Cart goes out from room to room offering the students an opportunity to make choices. There are usually 2 or 3 healthy items to choose from. The classrooms rotate, so that each classroom can have a turn to be the deliverer. There are many benefits to this program. One is that it enhances the in-classroom program by offering additional healthy foods. Another is that for many students the options on the cart are more attractive because of the novelty of the cart, than they are when offered by the teachers or their parents. Yet another is that this gives our students yet another arena in which to practice their communication skills, such as manding for the items they want, and scripting to offer items to each other. There are also the job skills such as setting up the cart, pushing the cart, and organizing it. We think it’s just awesome. We couldn’t do it without the help of the two foundations who have supported this program with grants – The Schenectady Foundation and The Hawley Foundation. Thank you to both of these amazing organizations for their help! 1/9/17 What is the Healthy Food Program all about? The healthy food program, which is funded by grants from The Schenectady Foundation and The Hawley Foundation, gives all classrooms at Crossroads the resources to plan and implement activities and lessons for healthy food and nutrition development. Each teacher develops a program to help the students in her particular classroom to gain interest in new and healthy foods, to increase intake of healthy foods, to decrease food rigidity, and to help develop lifelong eating patterns that are healthy and varied. This program is working to help combat the problems with poor nutrition that are present today with individuals on the autism spectrum. 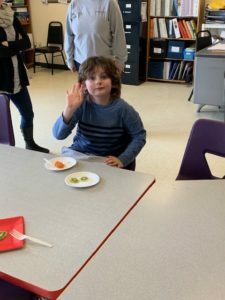 A very important aspect of the program is the high level of parent – teacher communication regarding which foods are being tolerated that might not have been previously, and certain strategies that are helping. This program is having all kinds of great success. Watch for our Happenings! updates here on our website to see some of the things that our classrooms are doing to help! Having the opportunity and experience to make your own snack makes eating healthy foods more motivating! And when you make your own snack look like a Snowman, well, who wouldn’t want to try eating that! The students in Room 4 made these banana snowmen in their Healthy Food Program. Our Healthy Food Program is an important aspect every week in all of our classrooms, helping our students develop healthy nutrition, through cooking and food prep activities, hygiene and life skills, and lessons about nutrition and fitness that are geared to the needs and abilities of the classroom. Our teaching teams do a fantastic job planning and implementing these lessons and activities in their classrooms. Teachers are seeing so much progress in their classrooms! Through their weekly parent newsletters, teachers communicate what they will be making. More individual information is written on the home-notes. 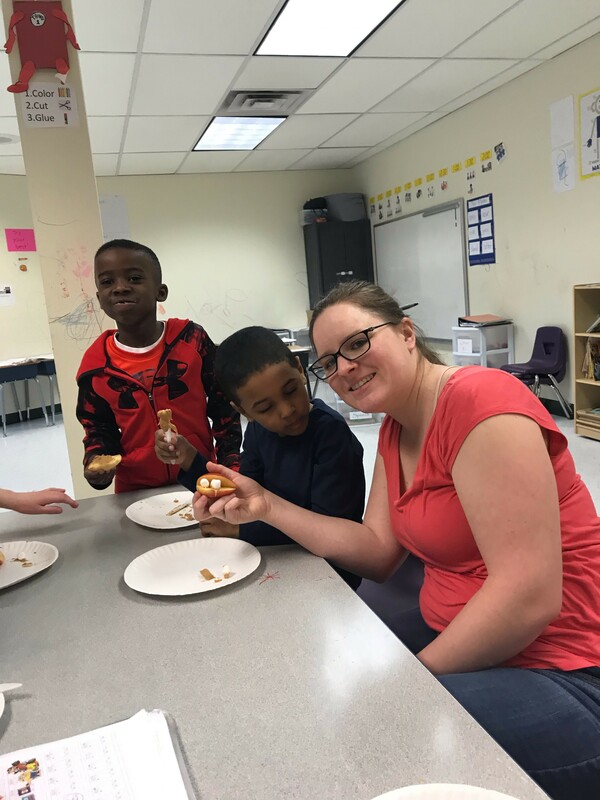 As well, parents who might want to come in during their child’s Healthy Food group time are encouraged to communicate this interest with their child’s teacher to schedule a time. 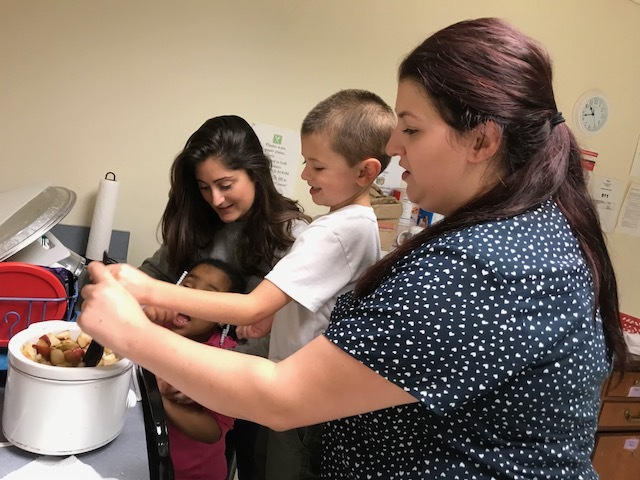 Our Healthy Food Program is funded by 2 grants – one from The Schenectady Foundation, the other from the Hawley Foundation. We are so thankful for this support for all the progress we see with our students. Reindeer Treats for Room 6 – they used graham crackers, peanut butter “glue”, raisin eyes, pretzel antlers, and an M&M red nose! Teachers and many parents are commenting that the students are more likely to try something new when they make it or help to make it. Also, modeling their peers helps some children tolerate new things. 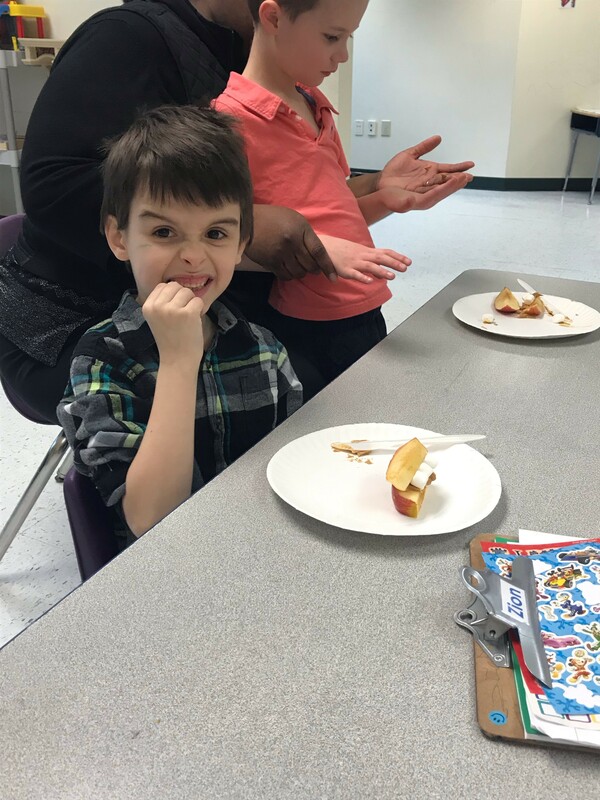 We are thankful to The Schenectady Foundation, and the Hawley Foundation for this grant-funded program that allows every teacher to plan and implement exciting Healthy Food projects in each class every week. 10/2016 – Healthy eating is super fun! What color is this vegetable? What is it called? Is it bigger or smaller than this vegetable? Taste it – yay!! 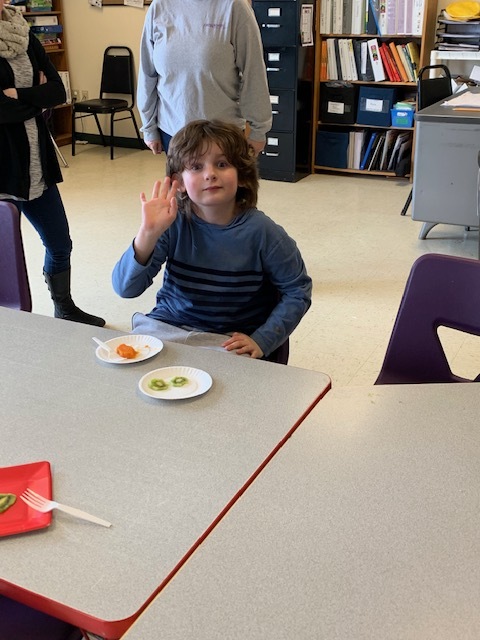 Ms. Deanna and her Room 7 team introduced steamed veggies last week with great success. Everyone had a try at each of the foods, and almost everyone kept eating. Room 7 has seen some excellent success this year in healthy eating goals, relays Ms. Deanna! The group gives them lots of opportunities for social interactions as well. This program, so important for our children, is funded solely through grants from two foundations this school year -The Schenectady Foundation, in Schenectady County, and The Hawley Foundation, in Saratoga County.